On Saturday, May 21, members joined artist David Bowen for a cozy discussion in the Mattress Factory café. David’s work SPACEJUNK premiered only the day before at the 2016 Factory Installed exhibition, allowing members to be among the very first to learn about the process behind the creation of SPACEJUNK! David uses robotics, sensors and custom-built software to explore the intersections between natural and mechanical systems. He kicked off the discussion by sharing some of his previous works, including Tele-Present Water, an installation that replicated the movement and intensity of water based on data from a buoy adrift in the Pacific Ocean. David designed a program to scrape data from a website that tracks the orbiting human-made debris. Then he built 50 machines to point twigs in unison towards the oldest piece currently above the horizon. What results is a mesmerizing (and sometimes startling!) display that is constantly changing as debris appear and disappear beyond the horizon. Up close to the works, members got to ask David all sorts of questions about the process of putting together the installation and the different components of the piece. “I love learning about such completely unexpected things like this and seeing the overlap with art and technology," one member shared. Join us for our next Coffee Date with Lauren Kalman on Saturday, July 30, 2016 at 10:30am. This Saturday, Mattress Factory members kicked of the new season of Coffee Dates with Irish artist Wendy Judge. Wendy is based in Dublin, but has been living in the Mexican War Streets in the Mattress Factory's Artist Residency space around the corner from the museum for the past month and a half. 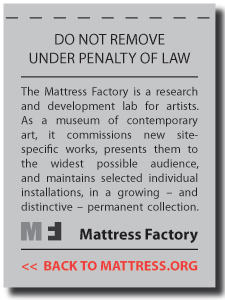 Wendy is one of four artists in the Mattress Factory's upcoming show Factory Installed that opens on Friday, May 20 at the museum's satellite gallery at 1414 Monterey Street. Members trickled in to the Mattress Factory Café to be greeted by hot coffee and tea, courtesy of Commonplace Coffee located around the corner on Buena Vista, and Arnold's Tea on East Ohio. Breadworks Bakery rounded out breakfast with a selection of their specialty breads. After everyone made their introductions, Wendy decided to take the members over to her working studio on 1414 Monterey Street. With just under two weeks until her opening, members had the private experience of seeing Wendy's installation in progress. "It's like looking into her mind," one member commented. Wendy described her work using phrases like "armchair travel" and "looking through a pair of backwards binoculars." Her sculpture--a now construction zone filled with plywood, blue foam board and grey paint--will soon morph into a beautiful landscape, a topographical study of land and earth. Wendy focused on strip mining in West Virginia as source material for her installation. Photographs of a recent trip to West Virginia line the walls of her gallery space. "I'm interested in the scarring that occurs on the land after strip mining," Wendy said. "The land reflects so much trauma in these pictures." MF members chimed in with their own stories and relationships to mining in the region. Wendy described her practice as "drawing in space." She uses no technology when rendering her sculptures. "It's actually quite an irrational practice, I guess." Wendy's installation, yet to be titled, opens Friday, May 20 at the Mattress Factory's 1414 Monterey Street Gallery as part of Factory Installed. The Opening Reception is from 6-8pm. $15 or FREE for MF Members, and students with valid ID from CMU and Point Park. Join us for our next Coffee Date with David Bohen on Saturday, May 21 at 10:30am.